Do you love having a biscotti with your morning almond milk latte, but think it's off-limits since you're vegan? Making a homemade vegan biscotti is easier than you may think, and can still stay true to traditional biscotti. Biscotti have a long history in Italy. The Italian word biscotti comes from the root words "bis," meaning twice, and "cotto," meaning baked. When biscotti were first made in Tuscany centuries ago, they were baked twice, giving them their unique shape and their firm and crispy texture. Today, biscotti are a favorite pairing for coffee, espresso, and cappuccinos. This homemade vegan honey almond biscotti recipe is made without eggs and dairy and agave nectar is substituted for honey. In a medium sized bowl, mix flour, sugar, whole almonds, finely ground almonds, baking soda, baking powder, salt, and cinnamon. In a separate bowl, blend the honey, water, and extract, then add to dry ingredients and mix well until well-blended. Turn dough onto lightly floured surface. Divide dough in half and form each portion into a log about 12 x 2 x 3/4-inch. Place logs onto a baking sheet coated with non-stick spray. Bake 30 minutes; remove from oven and cool for 10 minutes. Place log on cutting board and with a serrated knife, cut log diagonally into 1/2-inch slices, using a sawing motion. Place slices cut side up, on a baking sheet and bake for 15 minutes. Centers will be slightly soft but will harden as they cool. Remove to wire rack to cool. To get clean slices, be sure to use a serrated knife or a bread knife. Cutting with a sawing motion will also help make a clean cut. For long slices like you might find at your favorite coffee shop, cut the logs at an angle. 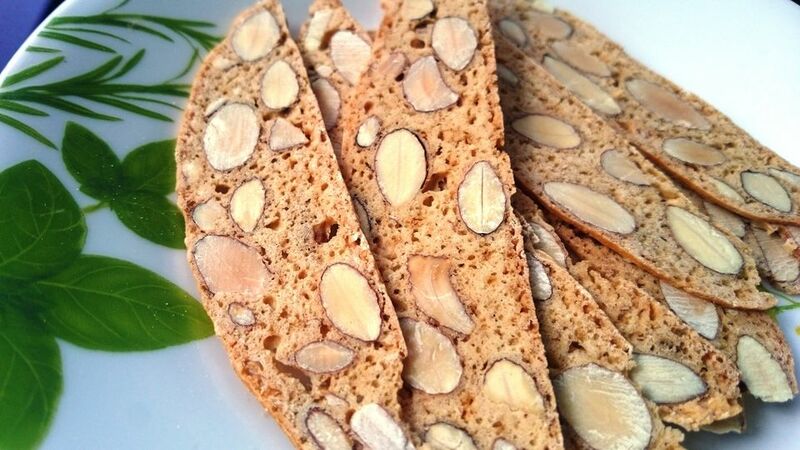 One biscotti provides approximately 61 calories, one gram of protein, 10 grams of carbohydrates, one gram of fiber, two grams fat and 43 milligrams of sodium.